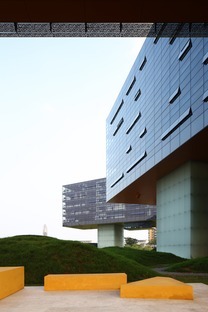 Steven Holl has constructed a building in Shenzhen the size of the Empire State Building, and its provocative design has earned it the ironic nickname of the horizontal skyscraper. This very large building has a light footprint on the area and the environment, with a series of volumes resting on a gentle slope in an expressionistic layout revealing its intrinsic architectural value. The result is a construction that rests on the ground, almost without making itself noticed, on eight big hollow pillars no more than 35 metres apart. This means the construction rests only minimally on the ground, for a building measuring 120,445 square metres on a 52,000 square metre lot, and is sensitively designed to enhance the landscape in which it stands. The skyscraper is a multipurpose structure in which every activity is developed horizontally, rather than vertically, hugely improving the management of flows among all the offices and other spaces it contains. 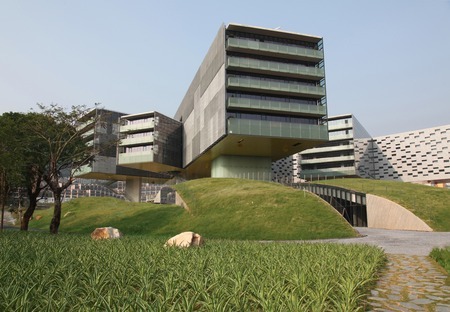 For though the building was financed by Vanke, the company that occupies most of the interior, 13,874 square metres, but it also contains apartments (25,704 square metres), a congress centre (8,292 square metres), a hotel (1,113 square metres) and the offices of another company, Soho (13,874 square metres). The building presents a number of important structural concepts, in that it makes the most of a construction technology normally used to build bridges. Here a network of cables holds the girders under tension, like in prestressed concrete, in order to achieve the vast distances between the big pillars without thick floor slabs and girders. The building never exceeds six suspended floors. The façade design also displays a lot of creativity, thanks to the use of sheds. And last but not least, the building displays a great focus on environmental sustainability, employing the best technologies for use of water and energy consumed and produced, qualifying it for LEED platinum certification in China. Client: Shenzhen Vanke Real Estate Co.
Curtain wall consultant: Shenyang Yuanda Aluminum Industry Engineering Co., Ltd.